Weston, CT Middle School Honors Veterans. Teaching children the importance of service. What could be a lovelier way to honor the Veterans in Weston and the surrounding communities than to spread hope? Weston Kiwanis sponsored the entire Weston Middle School to paint Stars of HOPE for the Veterans of Fairfield County. 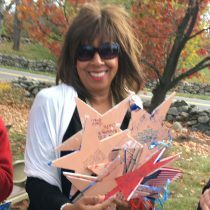 Weston Middle School teachers helped the students to create and message Stars of HOPE throughout the month of October. The Stars of HOPE that were painted by the students included notes of thanks and appreciation for their military service. 585 Stars were created, shared, and gratefully appreciated. The students learned about the importance of service, and researched powerful and meaningful quotes to include in their messages. 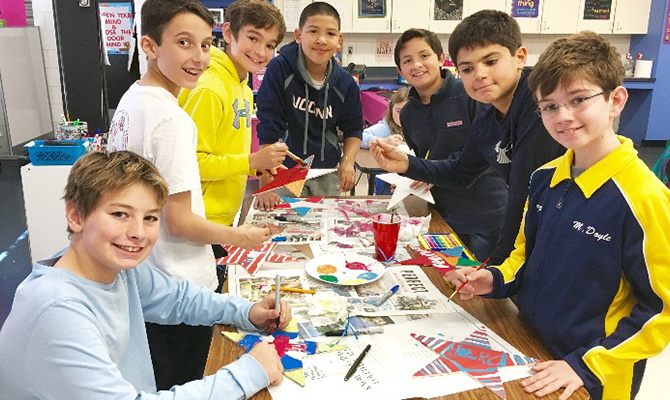 The students brainstormed words that expressed gratitude, and came up with uniquely individual and thoughtfully crafted expressions of hope and appreciation. Photographs were shared with our students so they could actually see how wide spread this project reached. To see our students standing tall and proud with the biggest grins on their faces, knowing they made a difference in a veterans life, is the greatest joy. This will be etched in the memory for life!